The new DBS and Superleggera all in one! ASTON MARTIN the UK sports car manufacturer is reviving one of the world’s most famous nameplates for its latest model, the DBS Superleggera. First presaged in April 2018 the DBS Superleggera was finally revealed last week. The latest DBS Superleggera will replace the Vanquish S to become the flagship of Aston Marin’s product line-up. This super GT revives the badge last seen on the car James Bond famously ‘rolled’ in the movie ‘Casino Royale’ in 2006, the new car also gets the Superleggera suffix which is Italian for ‘super light’ and recalls the original DBS of 1967 designed by William Towns. Aston Martin claim the DBS Superleggera is capable of going from zero to 62mph in 3.4 seconds and hit a top speed of 211mph. Clad in carbon fibre body panels the DBS Superleggera is a muscular model with epic performance. A design characterised by a bold grille in the front between new headlights and tail-lights, the generous proportions in between evoke aggression and athleticism. Beneath the bonnet the super-GT shares Aston’s turbocharged 5.2-litre V12 engine with the DB11, however the engine has been retuned to make 715 horsepower at 6,500 rpm and 664 pound-feet of torque between 1,800 and 5,000 rpm or 85 more horses than the DB11 AMR. Taking only 4.2 seconds in fourth gear to accelerate from 50 mph to 100 mph! 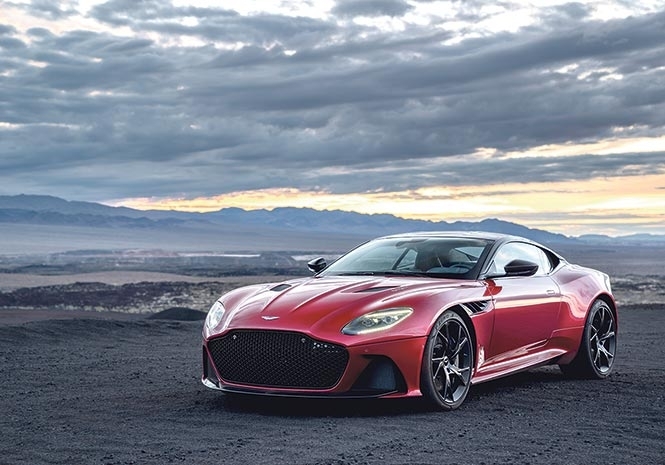 Dr Andy Palmer, Aston Martin President and CEO, said: “DBS Superleggera not only marks the return of a great Aston Martin name, but signals our return to the very pinnacle of the Super GT sector. “Handsome beyond measure, its lightweight carbon composite and aluminium body is sculpted into a shape with tremendous presence and charisma. Thanks to the remarkable torque available from its twin-turbo V12, DBS Superleggera also packs a breathtaking punch, yet its dynamics have been carefully honed to engage drivers of all ability levels. “Immaculately styled, obsessively engineered and outrageously potent, the new DBS Superleggera is every inch the Aston Martin flagship.” Costing €274,995 in Europe and £225,000 in the UK , deliveries of the DBS Superleggera are scheduled to begin in the third quarter of 2018. Bag one as soon as you can!